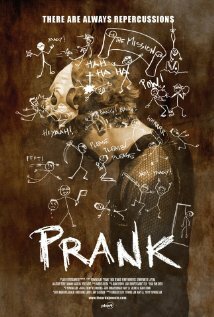 Prank (2013) – Enough with the handheld camera already! Long Story Short: Three teens plan to take revenge on their bully and document their every move on camera to show the creation of an epic prank. But things get out of hand and soon a fun idea turns into a nightmare. Review: Prank is entirely filmed with a handheld camera. The goal of these movies is to work with a low budget but also to create a more authentic atmosphere. We all remember the mother of these movies – The Blair With Project (1998) – and how excited everyone was to see this “real” footage. But the reactions were different: many loved it, some got nauseas, while others got bored or fell asleep. I think End of Watch was the only documentary-style movie that succeeded in what it was trying to do, and Chronicle was okay, too. But as far as the shooting-style goes this movie failed. The concept of Prank is very interesting and shows how far things can actually go when bully victims strike back, but at some point the story was all over the place and became totally unrealistic, but then again, when I think about it, things like that could actually happen. Or not? The acting was decent, the dialogues probably,too, but the constant turning on and off of the camera got on my nerves and I was more annoyed than interested. They definitely should have worked more on the storyline, given the the characters more depth, and made a regular movie. If you like these kind of movies watch it, otherwise I wouldn’t really recommend it. Pingback: Simon Says... WATCH THIS! Pingback: Worst Movies of 2013 | Simon Says... WATCH THIS!